I know what you’re thinking. How can right clicking make me more efficient in Sublime Text. I’m going to skip over the easy stuff like Copy, Cut, Paste, and Select All because that seems below the point of this article and to be honest most people should know command+c, command+x, command+v, and command+a already (although experience proves this isn’t the case). It’s ultimately better to do this with a plugins (which I’ll cover later). This option is useful if you need to run the file through another program or need to perform some other type of file level operation on the file. I randomly have problems with Sublime Text not noticing a file I added (or that have been added via a git pull) so I have to manually drag the file into the editor and this is helpful because I can use another file that’s close to get me into the right file. 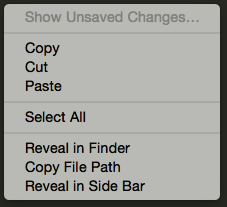 It’s extremely useful if you need to put the path of one file into another. The only real downside to this is that it’s not “smart enough” to understand where a file might exist inside a VM that you might be developing on. I’m not sure how it would do this but this is a huge help. 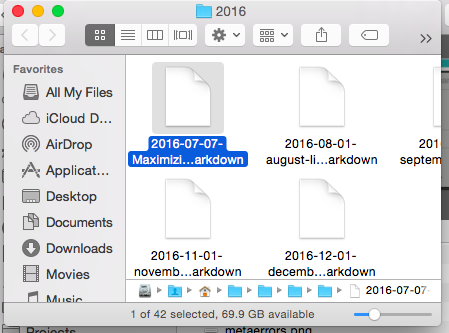 This option is useful if you need to create a new file in the same folder as your current file or you need to use on of those options above on the current file. I use “Rename…” more than I should. We’ll go over this feature more in a future post but this is a really powerful way to find items that need to be changed across multiple files if you don’t want to (or can’t) use grep to search a folder.